Omaha is a mid-sized Midwestern city, which means that it’s "s p a c i o u s". For most people a car is the main form of transportation. However, there are a variety of transportation options, and knowing the lay of the land can really make transportation here easy, whether by bus, bike, car, cab, or plane! Ask most Omahans the best thing about the city, and one of the first things they’ll tell you is, “there’s no traffic!” You can get almost anywhere in Omaha in 20 minutes, anytime, day or night. The city is built on a grid system with named streets running east to west and numbered streets running north to south. Dodge Street is the major east/west thoroughfare, and it divides the city into north and south sides. For example, North 50th Street becomes South 50th Street when you cross over Dodge. Seventy-second street was traditionally considered the dividing line between East Omaha, characterized by the Old Market and Downtown/Midtown, and West Omaha, which was thought of as suburban-styled expansion. As Omaha has continued to grow west, opinion on the new dividing line has shifted as far as 90th street and beyond, depending on whom you ask. Omaha sits directly on Interstate 80, with Lincoln an hour to its west and Des Moines two hours to its east. The city is very easy to access from the highway, with multiple exits serving the different parts of town. In Omaha, you can get off the highway and drive to the heart of downtown in a matter of minutes. I-80 is located slightly south of the city center, with I-680 wrapping around the west and north parts of Omaha. I-29 runs north to south, hugging the eastern shore of the Missouri across the river in Council Bluffs, IA, Omaha’s sister city. Kansas City is 3 hours and 15 minutes south of Omaha, while Sioux City, IA is 1 hour and 45 minutes north. 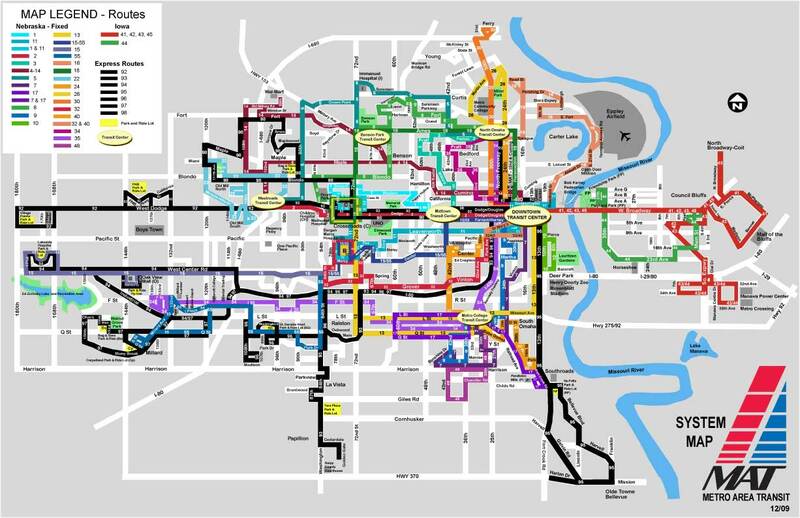 Omaha City Bus Routes (click to enlarge)Busses are not a terribly popular form of transportation here—most locals drive—but they are cheap and effective provided that you know the routes and have a destination along those routes. The Omaha bus system goes by the name MAT, short for Metro Area Transit. MAT buses require exact change. Drivers are not supposed to handle money or make change, though some might. If you’re really stuck with big bills, you can always ask a friendly Omaha native for help, they’ll probably understand. Remember to purchase a transfer if you’re going to be using two buses (which is likely if you’re coming from the airport, unless you’re staying downtown). Don’t worry, transfers are cheap. 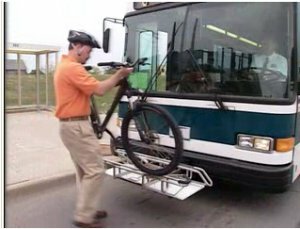 MAT Bike Racks in actionMAT busses feature bike racks on almost all of their vehicles. If you’re worried about using a bike rack for the first time, check out the instructions (with pictures!). Busses won’t always brake unless hailed, so wait by the stop, get your arm out, and start waving to ensure the driver stops for you! Bus stop signs are blue and white with a picture of a bus and the MAT logo. The MAT website has a trip planner designed to help you plan your bus trip, but it can be confusing to use, and is not always as helpful as it could be. An easier solution is to use the route map to find the line you need, and then look at the route time table. The tables are clearly laid out with all stops, and the buses are almost always on time. 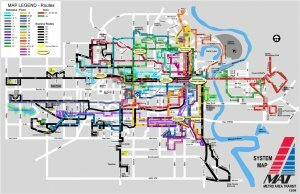 Because of Omaha’s grid system, it is pretty easy to follow a bus’s route and find the stop you need. Cabs are not the most common way to get around the city, but because Omaha is relatively compact, they are an effective way to begin the night or get to where you need to go if you’re in a pinch. Happy Cab, Safeway Cabs, Baratta Taxi, and Cornhusker Cab Co. all vie for business in Omaha, and with prices being roughly equal, preference comes down to personal loyalty. The drop flag rate is about two bucks, and it will cost roughly .30 cents every 1/7th after that. Happy Cab has a convenient table of flat rates from Eppley Airfield to most of the major hotels. For comparison, a ride from the airport to the Old Market should cost around $12. The bicycling community in Omaha is small compared to some cities, but there is a passionate base of daily commuters, weekend warriors, and cyclists out for a fun afternoon ride, especially in the warmer months. The challenging thing about riding in Omaha is the general lack of bike lanes, and the reluctance of some motorists to really make bikers feel welcome. Omaha’s Keystone TrailIf you are lucky enough to be biking along some of the Activate Omaha bike routes, your ride will be decidedly more pleasant, with wide lanes and other bike friendly accommodations. Activate Omaha has an incredibly detailed map of the city, showing friendly routes, bike shops, and other points of interest to bikers, in addition to a clear map of the rest of the city. Unfortunately, most of Omaha falls into the latter category and is not nearly as friendly as those select routes. This is partially made up for by Omaha’s wonderful trail network. The trails are paved, well maintained, and aside from dips below overpasses, relatively flat. 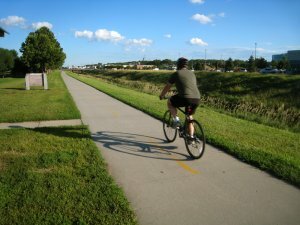 Omaha Trails maintains a comprehensive map system for the over 20 miles of bike trails in Omaha. With a little planning, it’s really possible to travel great distances in the city, passing by parks and streams all the while, avoiding the roads. It’s incredibly easy to access compared to other cities, with drive times of ten to fifteen minutes from downtown. Eppley Airfield features easy parking, access to discount carriers, rental cars, and a good variety of domestic routes. This map will give you an idea of the most popular routes from Omaha, while this table breaks down all regularly scheduled destinations originating from Eppley by carrier.